Here’s a closer look at the new Mercedes-Benz C 180 Avantgarde and Mercedes-Benz C 300 AMG Line. Both models effectively form the new base and top-range W205 models (sans the AMG C 63) respectively, and are priced at RM228,888 for the C 180 and RM307,888 for the C 300. The C 180 is priced RM20k less than the previous base variant, the RM248,888 C 200 Avantgarde Line. It features a 1.6 litre four-cylinder turbocharged petrol engine that develops 156 hp and 250 Nm, and goes to 100 km/h in 8.5 seconds, on to a top speed of 223 km/h (compared to the 194 hp/300 Nm 2.0 litre turbo C 200’s 7.3 seconds and 235 km/h). Like all other locally-assembled C-Class variants, a 7G-Tronic automatic transmission is equipped here. On the outside, the C 180 gets a new set of 17-inch five-spoke wheels. Elsewhere, it’s as per the C 200 Avantgarde, with LED High Performance headlamps and dual exhaust tips fitted as standard. Inside, the C 180 misses out on the C 200 Avantgarde’s memory function for the powered seat, reverse camera and ambient lighting. It also gets single-zone air conditioning, unlike the C 200’s dual-zone system. Apart from these, the new base variant gets the standard Avantgarde Line look — three-spoke multi-function steering wheel, leather seats, chrome trim on the dash and door cards, and piano black trim on the centrepiece. Other key items include an Audio 20 CD infotainment system (with Garmin Map pilot), a touchpad on the centre console, and a seven-inch display screen. Meanwhile, the C 300 AMG Line is now the range topper, priced RM20k more than the C 250 AMG Line. The new boy is specified very similarly to the existing C 250, but adds a higher-tuned engine, larger 19-inch alloy wheels, a sports exhaust system and a three-zone automatic climate control system. The 2.0 litre four-cylinder turbo engine makes 245 hp and 370 Nm — 34 hp and 20 Nm more than the C 250 (211 hp/350 Nm). 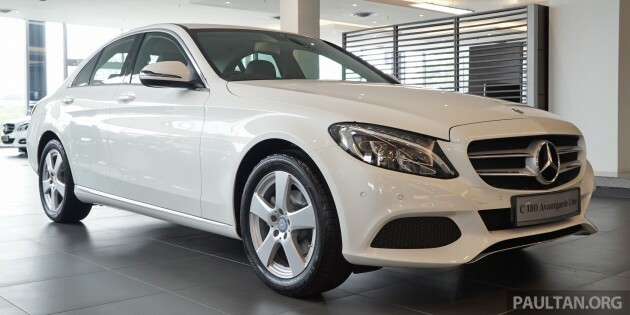 The C 300 goes from zero to 100 km/h in 5.9 seconds and has a top speed of 250 km/h – notably quicker than the C 250, which performs the feat in 6.6 seconds. The sports exhaust system offers a much throatier engine sound, through an active flap in the system that is activated by selecting Sport+ mode. Outside, it gets the full AMG Line appointments (sportier bumpers, side skirts), along with LED Intelligent Light System headlamps with Adaptive Highbeam Assist and a panoramic sliding glass sunroof. Inside, an Artico leather-covered dash, open-pore wood trim, COMAND Online infotainment system (with integrated navigation) and an 8.4-inch display screen come standard. A 13-speaker, 590-watt Burmester surround sound system is also included, along with an Active Parking Assist (also on the C 180) feature, a reverse camera, keyless entry, remote boot lid closing and an Air-Balance perfume package. Compare the entire Malaysian W205 Mercedes-Benz C-Class range in detail on CarBase.my. 318i 210K, Audi A3 180K or C180 230K?? Where got people compare Audi A3 one? Compare with A4 please. a3 is a valid comparison but please take the top spec 1.8. A3??? That little car is comparable to 3 series and C-Class???? Not much exterior diff apart from the rim design between the C250 and C300 AMG Line though. Paultan.org should test drive the C300 to see how good it handles on the road and if the sports suspension does help the car come closer to the F30’s handling department. most people would pay 10% more for the merc or bmw or audi badge. 230k over 174k is more than 30%! Merc, the master craftmanship of car & engine for 130 years. Yet, 1.6 turbo 2016 can only produce 156hp? What a joke? Cmmon, germanic, youre beaten flat at your own enginering supermacy. Boring 30 years ahead? more precisely, 318 is now 202800 before discount, memory seat and dual zone aircon come as standard, c180 228k with single zon aircon?!! Car pricing in MY really screwed up. Add RM20K for only extra 50Nm, ambient light, reverse camera and seat memory? That’s all? And only 2 years warranty? For those who say, “work harder” <— go stuff yourself. Well 1600cc and 2000cc has a big difference especially when u use a piggyback or remap the ECU while the C250 and C300 uses the same engine whereby the C250 can be tuned to match the C300 output figures. Oh you forgot to add in the 18 inch rims that the C200 has over the C180 too. RM20k diff does sound good compared to the RM5k extra u need to pay to have fancy lights in the Mazda 2. Why 5k is an issue? How do you justify? F30 316 got xenon light? alamak, the question is why cheap cars can have reverse camera, why expensive car can’t offer? It is all about SAFETY! what if u bang ur kids if your car doesn’t have reverse camera? buy this lowest specs merz 230k, i will rather spend 200k on mazda6 and mondeo with higer specs in term of powertrain & tech… when ppl see this c180, ohhh that’s the cheapest c-class, when ppl see mazda 6 & mondeo, ohh gaya! U dont need a C180, even A180 parking side by side with Mazda 6 or Mondeo already makes a big difference. The 3 pointed star logo is good enough to justify. I want dat c300…. So badd…. Even with forced induction engine, a C200/C250 (1991 cc turbo with different state of tune) fuel consumption can be same or even lower than C180 with 1595cc turbo engine due to it’s bigger body size compare with their compact trio class (that is A/CLA/GLA, even GLA for me need to be at least 250 version while lighter and smaller A and CLA feel just right with 200 version that mated with similar engine displacement and output with C180). That is why the i8 needs speakers to generate better engine sound. Else it will sound not much better than the Axia, from engine perspective. Modern or oldern, the technology cant beat law of physics. technology cant beat law of physics?cant understand what do u mean..
5.1L vs 5.4L over 100km is considered as a lot more efficient? well if u look in long run the saving is more prominent..u already save about 20k in the car price, then cheaper road tax, better 8 speed gearbox which is smoother, more fuel efficient etc..
bro do u even logic ?if u can spend 200k on a car, who the hell would even care about a few ringgit difference in fuel consumption ? Mercedes Benz, if you want to give warranty please give it willing and with dignity. Do not waste our time with your corporate policy and delay tactics until we cannot wait anymore and then take our cars to outside workshop and fork out our own money for repairs. Really, it takes more than 6 days for you to decide to warrant a tyre???? Come on don’t waste my time please.